Our focus is the development of world-class schools. World class in all facets of our operations - curriculum, teaching methodologies, staff quality, libraries, technology, buildings, resources, facilities, management and so on. 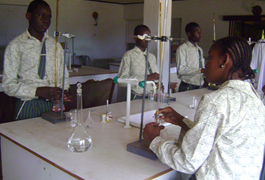 In order to sustain our mission to deliver world- class education to children inculcate high moral and ethical values as we prepare them for a life of service and fulfillment, we have embarked on a number of school improvement initiatives in recent years..
Based on wide research into major international curricula, the Nigerian curriculum inclusive, we developed a curriculum that has extensive extra and cross-curricular linkages that is project and enquiry based and focused on building the skills that will ensure success in the 21st century. The scope of teaching is clearly to align with teachings that will promote lifelong learning and survival skills for the 21st Century. Skills like collaboration across Networks, Critical thinking and Problem solving, Adaptability, Initiative, Effective Oral and Written Communication, Curiosity and Imagination, accessing and analysing Information. Marigold is a school with a mission to change the course of education in this our generation, transforming the destiny of young pupils in guiding them to their maximum potential. This is a School that operates with the un-derstanding of the different stages of child development and applying them by indulging the children in activi-ties and trainings that motivates and brings out the inner strengths and abilities. we believe that there is no dull child, our professionally trained teachers have been equipped with the skills that can stimulate even the weakest and dull child to brightness. we identify your child’s weakness and build learning activities to stimulate the strength to overcome such weaknesses. We focus on the individual child to achieve a maximum result. we strive to give the children the best and highest possible academic, Christian and moral educa-tion, we strongly esteem and promote good moral upbringing, with emphasis on the need for self-discipline and telling of the truth at all times, the need for good manners, and respect for individuals and properties, sharing and love for mankind.